Most people need a mortgage in order to buy a home. The term 'mortgage' is commonly used to describe the loan obtained to fund a property purchase. However, technically the mortgage is actually the charge placed on the property in favour of the lender. For this reason the borrower is known as the mortgagor because he gives a mortgage to the lender, the mortgagee, in return for the loan. The article below describes some of the main types of mortgages. With a repayment mortgage the borrower will pay a monthly instalment which will be partly interest on the loan and partly a capital repayment to pay off the original amount advanced by the lender. Traditionally these mortgages have had a 25 year term – although they can, of course, be for longer or shorter periods. At the end of the term, the borrower should owe nothing to the lender – provided that they have complied with the terms of the mortgage. The borrower may be required to take out a specific life assurance policy at the same time as the loan to ensure that the mortgage will still be repaid in the event of the borrower’s death. Many mortgage companies have an age cut-off point for mortgages. Older borrowers may find that they are offered mortgages with much shorter terms – leading to higher monthly payments. Interest only mortgages, as the name clearly suggests, contain no element of capital repayment. All that the borrower pays each month is the interest on the original loan. Interest only mortgages often seem attractive because the instalment will almost invariably be lower than on a repayment mortgage. However, there are two main points to bear in mind. Firstly, the interest rate on this type of loan may be higher than on the most competitive repayment mortgages. Secondly, at the end of the mortgage term the whole of the original advance will have to be repaid. An interest only mortgage may seem like a good idea in the short term, but borrowers with this type of loan must make sure that they have some kind of financial policy in place which will repay the loan at the end of the term. Borrowers who fail to make the necessary arrangements could otherwise be forced to sell the house at the end of term – or face having it repossessed by the lender. An endowment mortgage is similar to an interest only mortgage in that the monthly instalment contains no element of capital repayment. Instead, the borrower takes out a special investment policy and pays premiums towards this every month, on top of the interest payments. The theory is that, at the end of the mortgage term, the surrender value of the policy will be sufficient to repay the amount advanced under the mortgage. There have been numerous cases in recent years where borrowers with endowment mortgages have found that the endowment policy does not cover the balance due on the loan. A borrower in this situation then has to make up the shortfall out of their own pocket. For this reason endowment mortgages have, to some extent, fallen out of favour. 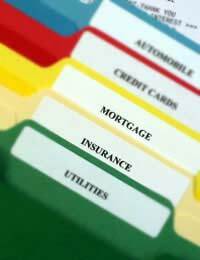 Some types of mortgages are stated to be payable on demand or are described as being 'all monies charges'. This type of mortgage may not necessarily have any monthly instalments and is often used to secure an overdraft or business account against someone’s home. Once the lender decides to recall the loan, or debt, the total amount becomes due for repayment immediately. Interest is forbidden in Islam and, as such, the conventional mortgage is not suitable for Muslims. Banks, naturally, have found a way to get round this problem. Instead of lending the buyer money to buy a property, the bank effectively purchases the property in partnership with the buyer – the deposit represents the buyer’s initial share. The buyer then pays a monthly rent to the bank for the term of the mortgage. This rent slowly purchases the bank’s share of the property until the buyer owns 100% at the end of the mortgage term. Buyers need not be Muslim to be eligible for this type of mortgage.